Kathryn Tovey is painting fluid lines of lilac at the Art Club stall. She’s got her back to sun, and the beautiful comings and goings of the market day crowd. Kathryn’s halfway through this mural, and halfway through a 12-month exchange from her home country of England. 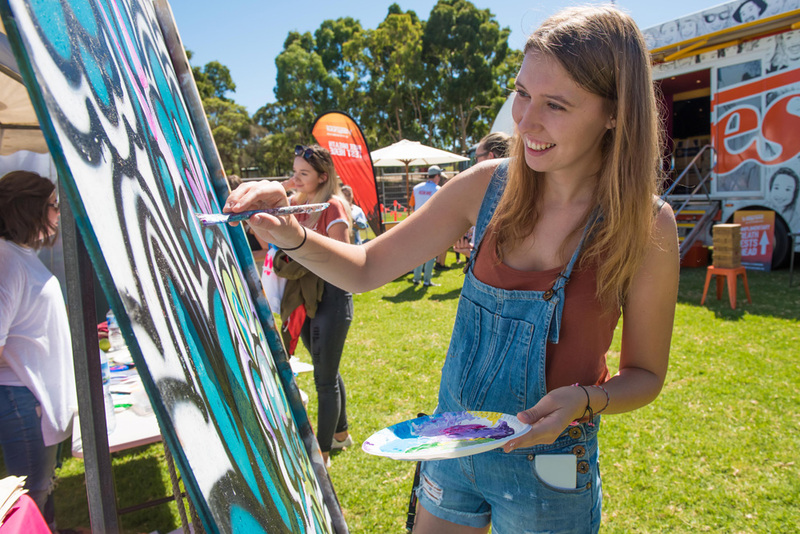 She says she chose to come to Bendigo because she loves Australia, loves the bush and the kangaroos – especially the ones on campus. “I’ve been travelling around, I’ve been up the west coast, and to Brisbane and Sydney,” she says. “I like Bendigo because it’s surrounded by nature, it’s a short drive into the city and there’s a great sense of community here. The Mob at Market Day. It’s a perfect 26 degrees for this annual showcase of Bendigo Student Association clubs and societies. Warm enough for outdoor education students to lure the masses with chunks of watermelon and orange segments. It’s an innocent way to promote something called The Mob. “Can I have my photo taken with the rest of The Mob?” asks James in his borrowed white sunnies. 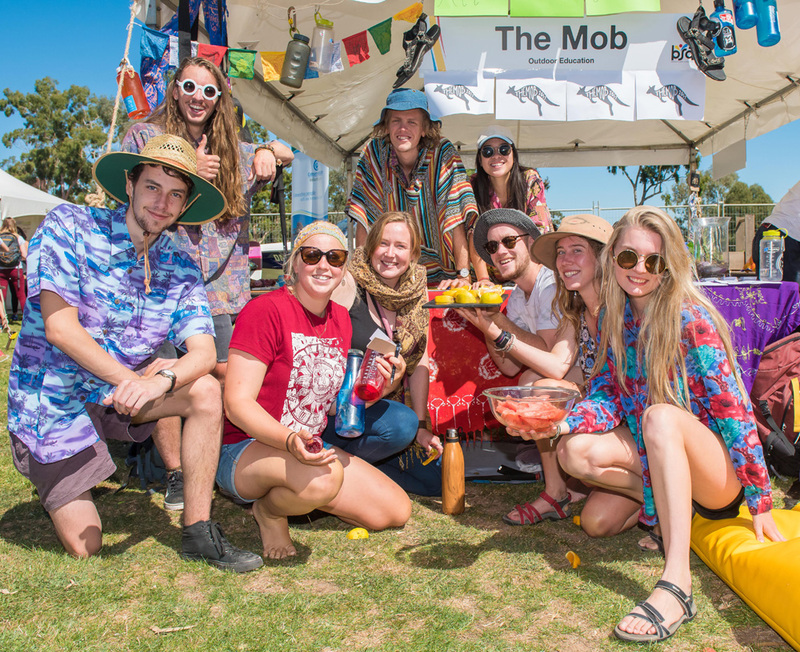 Turns out The Mob is the name given to the outdoor education student club, one of the most popular on campus. A membership is a ticket to untold adventures and crowd-pleasing discounts at the local pub. City of Greater Bendigo deputy mayor Rod Fyffe. 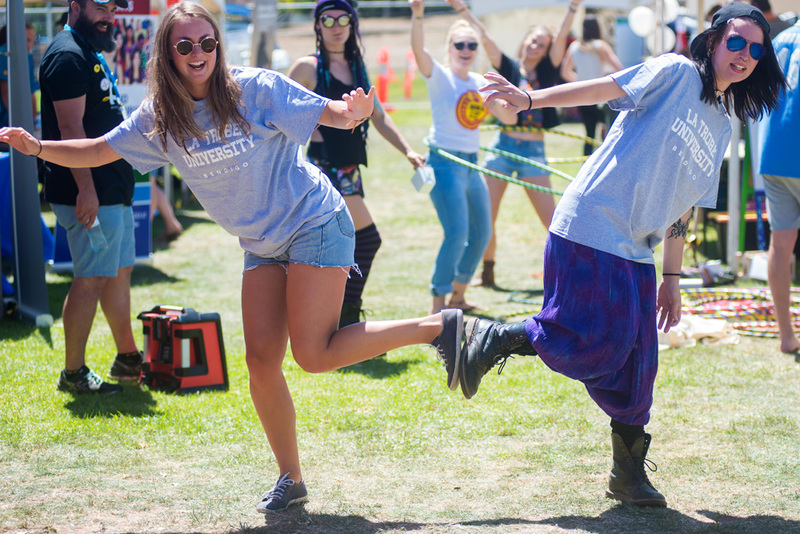 A civic ceremony to welcome new students backs up this statement. 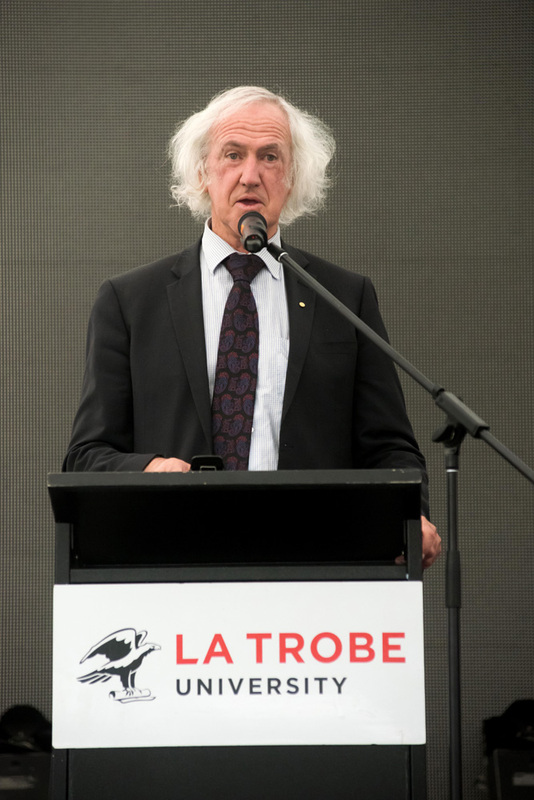 Bendigo’s deputy mayor-with-the-hair Rod Fyffe looks out across the record 100-market stalls and encourages students to connect with the opportunities in Bendigo. 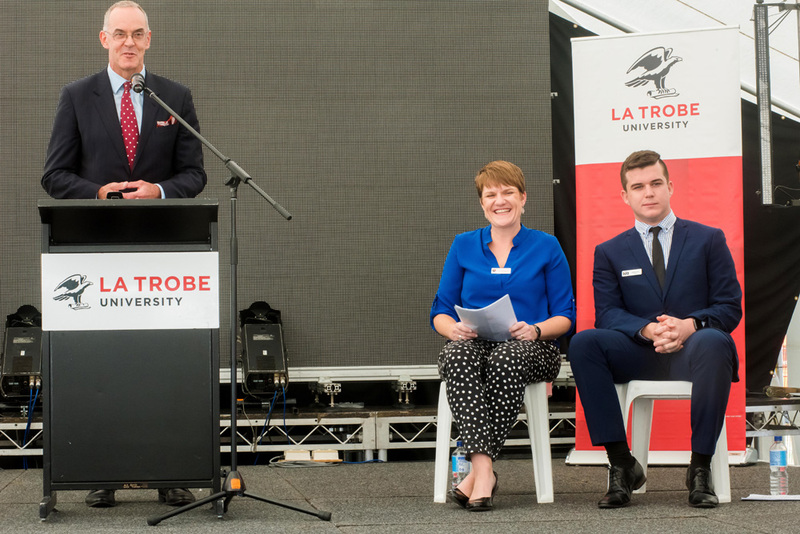 Head of campus Rob Stephenson, City of Greater Bendigo councillor Yvonne Wrigglesworth and Bendigo Student Association president Andrew Mair. 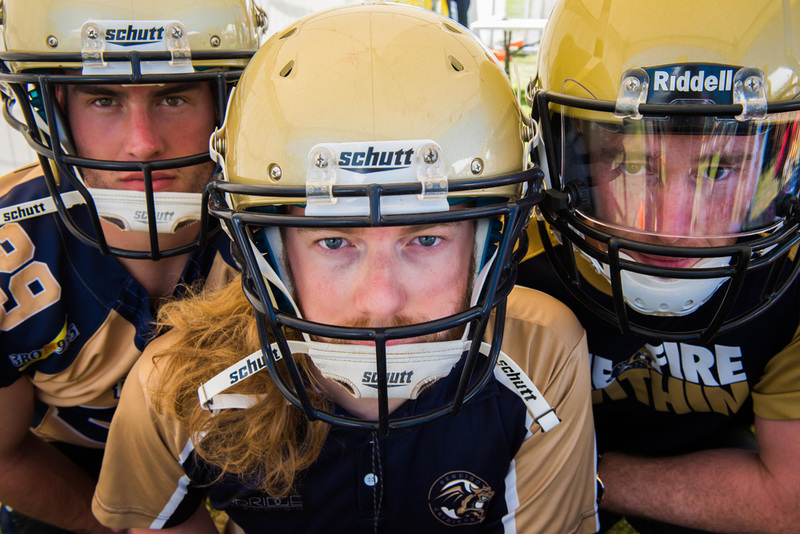 Exercise physiology student Darcy Young (centre) and his fellow friendly gridiron players. Or, there’s always gridiron. Exercise physiology student Darcy Young is representing his team at the Bendigo Dragons stall. He’s been playing for the local gridiron team since it formed in 2012, and this year takes on the role of defensive coach. We wonder, do his studies give him an edge on the field? “It helps me with training more so than during games. Although I am keyed into other players and how they’ve moving, so that maybe gives me an advantage,” he says. Next to the Dragons stall Imogen Smith’s tattoo of actor Vincent Price catches the photographer’s eye. “He’s my favourite horror actor, I’ve been obsessed with him since I was a little kid,” she says. Imogen Smith says uni students make great roller derby players. 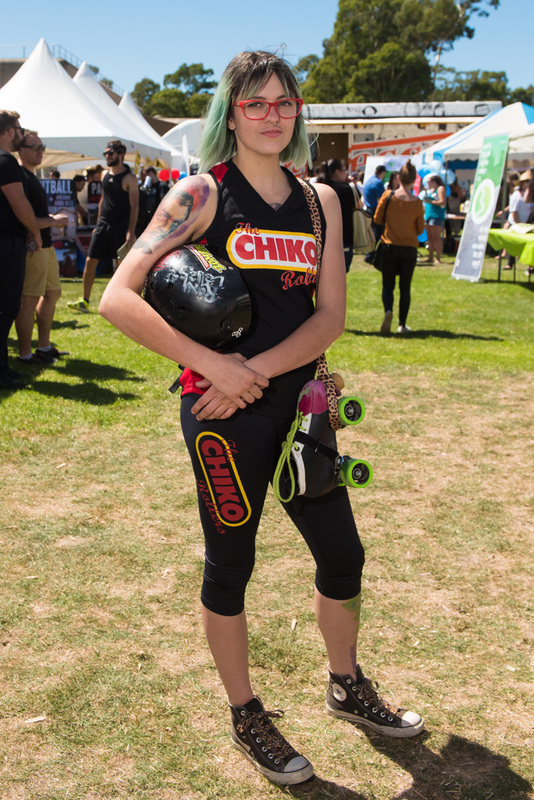 Imogen is here to recruit new players to the Dragon City Derby Dolls and its team the Chicko Rollers. She says uni students make great derby players, adding the sport is a lot like studying; it takes commitment, dedication and passion. “It’s a lot of work and you’ve got to commit but we accept anybody who wants to play into the league,” she says. 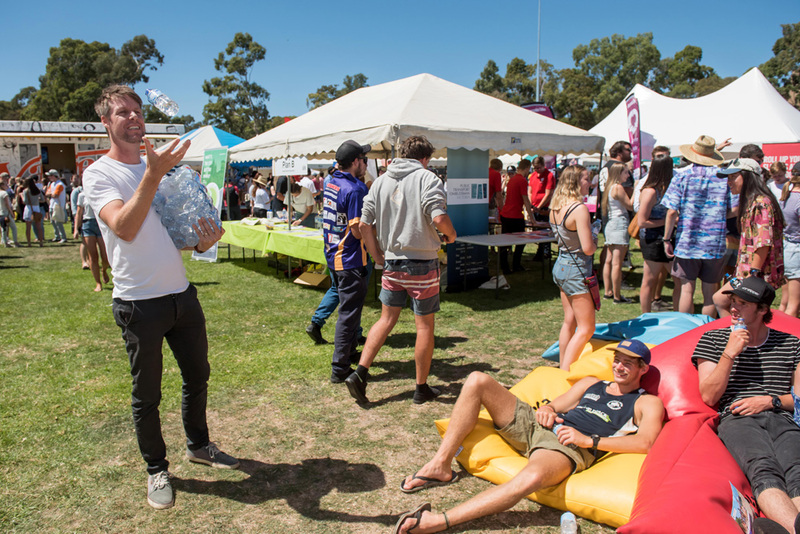 Imogen is completing a personal training course this year, to help with job prospects and with the league, but next year plans to be on the other side of the stall for O-Week.